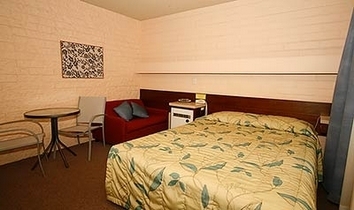 MAHOGANY MOTEL has 14 - 1 & 2 bedroom units, 2 blocks from CBD, Garden court yard with table chairs& umbrella, free b'que,kids playground. Family room with queen bed and 2 singles in 2nd bedroom, with door,kitchenette,ensuite,32"plasma,austar,internet,b/fast & computer bench. Family room with queen bed and 3 singles in 2nd bedroom, with door,kitchenette,ensuite,32"plasma,austar,internet,b/fast & computer bench. Queen bed with kitchenette,32"plasma,austar,internet,b'fast & computer bench,ensuite. 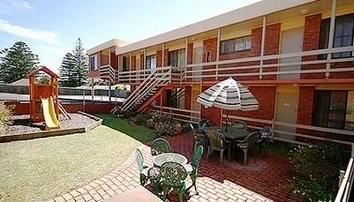 luxurious Queen bed, large corner spa,kitchenette,32"plasma,austar,internet,dvd player,table & chairs,ensuite. checkin 2.00pm,checkout 10.00am. late checkouts available $10 p/h. FREE Parking at rear of units.some under cover.